Some recent rumors claim that Samsung could launch quite a few Galaxy A handsets this by the end of the year, and the Galaxy A40 is one of them. 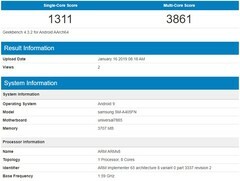 The device with the model number SM-A405FN has recently surfaced on Geekbench and its specs include the Exynos 7885 processor, 4 GB RAM, and Android 9.0 Pie-based software. Although everyone is eagerly waiting to see the upcoming Galaxy S10 lineup, Samsung also has two lineups of more affordable handsets in the pipeline. The Galaxy M trio is supposed to launch in India at the end of the month, but the Galaxy A lineup could bring no less than nine new devices to the market by the end of the year. Until now, some Galaxy A devices already surfaced online, and the latest to do so is the Galaxy A40. Yesterday, the Samsung device with the model number SM-A405FN was added to the Geekbench benchmark database. There are four individual entries for this model so far, but all reveal the same hardware and software details: the octa-core Exynos 7885 processor with a clock speed of 1.59 GHz, 4 GB of memory, and Android 9.0 Pie-based software. In addition to the above, some rumors mentioned that at least the more powerful and expensive Galaxy A handsets will come with an in-display fingerprint reader and a 3D TOF camera. These new devices are expected to hit Europe first, but other regions — like India — will get them as well. 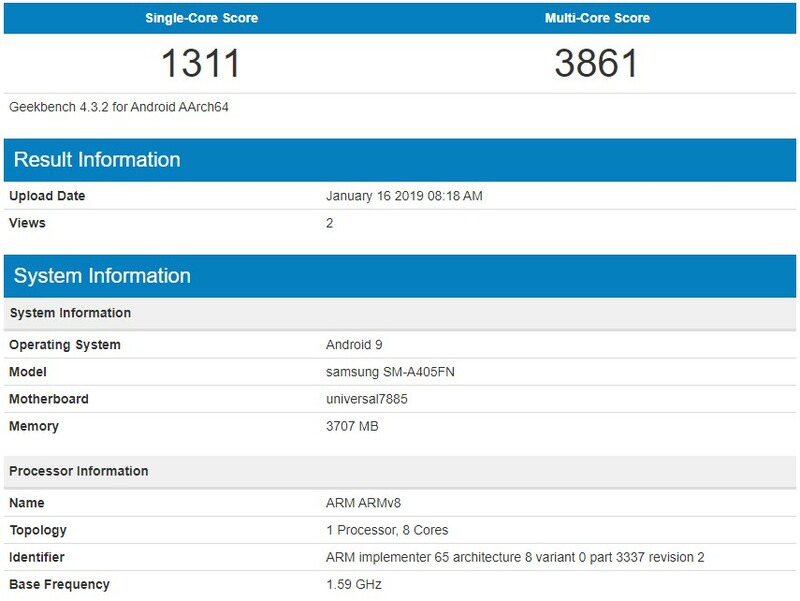 The Samsung Galaxy A40 arrives on Geekbench one month after the Galaxy A50, which had a similar model number. Obviously, Samsung still has to unveil these new devices, so all these bits and pieces of information should be taken with a grain of salt for the time being.